VAN WYCK GAZETTE-Lost Roundout: A Story of Urban Renewal Brings to Live a Vanished Community! In the early 1960s, Kingston’s waterfront Rondout district, once a vibrant commercial center and the busiest port on the Hudson River between New York City and Albany, had fallen on hard times. Like so many other working-class neighborhoods in cites throughout the Northeast and Midwest, Rondout, or downtown, as it was known to locals, had lost most of the industries that had enabled it to prosper and its retail sector and housing stock had become obsolescent as suburban growth exploded in the postwar years. With the passage of Title One of the Housing Act in 1949, the federal government made available millions of federal dollars that enabled cities to tear down what was dubbed “blight” and offer the cleared land to private developers at a discount. The expectation was that new Modernist buildings would provide better housing for the poor and result in more appealing commercial and residential districts as a way to lure investment dollars back to the city. Rondout, once a separate town that had boomed with the opening of the D&H Canal in 1828, which enabled coal from Pennsylvania to be transported by barge to the port and from there down to New York City, was a place of immigrants and millionaires, who built their mansions on the bluffs overlooking the crowded, smoky city. Trapped in a long, steady decline and the place where the city’s poorer citizens resided, it was nonetheless a vibrant neighborhood up to the late 1950s, its hundreds of mom and pop stores offering residents, many of whom didn’t have cars, everything they needed. It was a place where everyone knew everybody, where many business dealings were based on trust, where kids played in the streets and nobody worried. Because it was poor, the rows of Italianate brick buildings, dating mostly from the post Civil War years up to 1900, were little changed, their original iron-columned storefronts, some bearing clerestories of stained glass, and signs reading “ship chandlery” and “M. Kerby Dry Goods,” still intact. But back in the early 1960s, when everyone wanted to live in a ranch house and the strip mall was fast replacing Main Street, such attributes counted for little. The Broadway East Urban Renewal Plan devised by planners in 1961 sought to replace the old infrastructure with a shopping center and multi-unit, Modernist apartment buildings, and in 1966, after obtaining $9 million in federal funds, the demolition began. By 1970, nearly 500 buildings had been taken down. Entire streets vanished, to be replaced by two low-income housing projects and a huge vacant lot. Thousands of people had been displaced, many of them African American families who could not find housing elsewhere in the city. The small remnant of buildings that remained on the west side of Broadway and West Strand was boarded up and abandoned. Rondout had died. As a young man delivering flowers for his father’s Port Ewen-based florist business, Eugene Dauner, distraught at the loss of his community, took nearly 1,000 slides of the doomed area starting in the early 1960s. 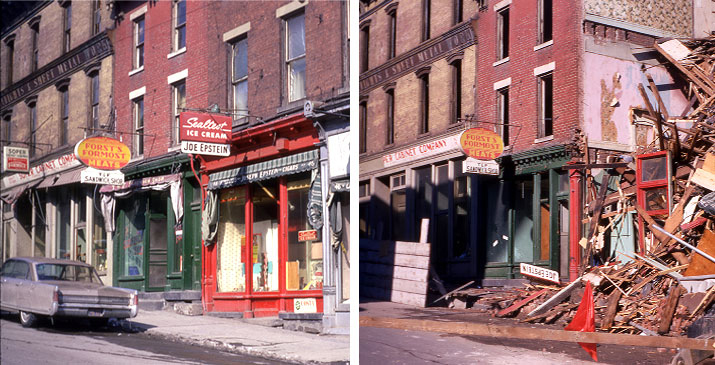 Dauner’s photographs and the story of urban renewal in Rondout is the subject of a new film, co-produced and co-directed by Lynn Woods and Stephen Blauweiss, entitled Lost Rondout: A Story of Urban Removal. Dauner’s slides, thanks to their wonderful depiction of late afternoon light and careful composition capture the similar sense of abandonment, mysterious passage of time and sorrowful emotion embodied in an Edward Hopper painting, constitute a meticulous photographic record of the vanished neighborhood. The film utilizes Dauner’s slides as well as images by other photographers and archival footage, including 1930s footage of tugs on the creek and excerpts from a 1969 IBM recruitment film (IBM had constructed a massive plant on the outskirts of Kingston in 1954, spurring a boom in suburban development that serves as a distinct counterpoint to the obsolescence of Rondout’s urban streetscape) to re-create lost Rondout. Interviews with former residents bring the destroyed neighborhood back to life—its bars, clothing stores, and bakeries - as well as the difficulties of being relocated. Commentary by historians, urban planners, including the original urban renewal planner, and city officials provide perspective on urban renewal, which impacted cities across America. The film also chronicles the area’s slow recovery from total abandonment to the flourishing waterfront neighborhood of restaurants, antique shops, and cultural attractions it is today, even as the city still struggles with urban renewal’s problematic legacy. The hour-long film is nearing completion and will be screened November 21 and December 4 at the Arts Society of Kingston, 93 Broadway, at 7:30 pm. Tickets are $10. For more information, visit www.lostrondout.com, the Lost Rondout Facebook page, or email info@lostrondoutproject.com .